Sheet jointing of 98% pure exfoliated graphite. An Ultra High Purity (99.8%) grade is available for nuclear industry applications. • Potable water duties and repeated use with foodstuffs. 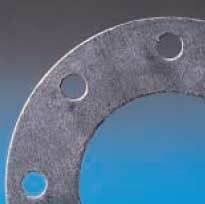 • Very easy to cut – but large gaskets may need support during carriage and fitting. WRAS approved for use with hot and cold potable water up to 85°C. Precision cut gaskets to any shape, size and quantity. In sheets: 1m x 1m, 0.5m x 1m. Sheet thicknesses: 1.0mm, 1.5mm, 2.0mm, 3.0mm. Rolls up to 60m long; widths 1.0m. Roll thickness: 0.5mm.